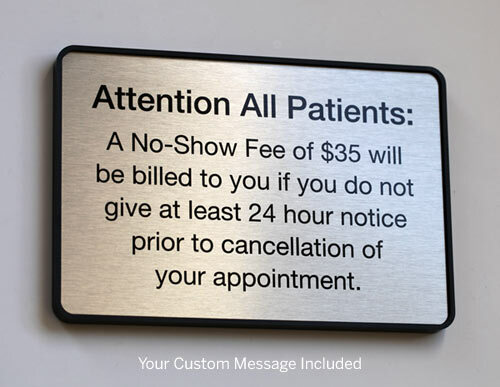 9x2", 6x6" or 9x6" custom co-pay message signage. Free personalization. Create your own check in sign or registration sign. 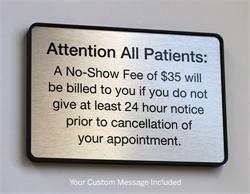 Customize these copay signs any way you like - your signs can have ANY personalized text and corporate logos to display your co-pay instructions, payment details, check-out information or company policy - and so on. Free text personalization and logos, no added fees. Use the Special Instructions at the bottom of this page to insert your customization text or simply send us an email with special instructions. Please have our design team create a digital proof. 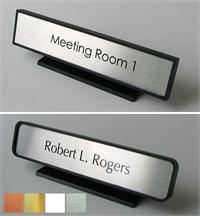 Small Office/Exam Room Name Plate Sign - 4" x 2"
4 1/8"W x 1 3/4" Multi Purpose Office Sign w/black frame. Used in Hospitals for exam room numbers or exit signs. 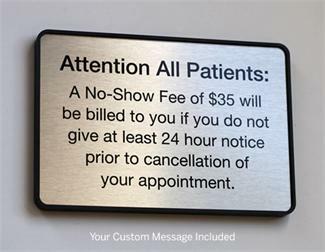 Or personalize this sign with the text/graphics you need for your office sign needs. Great for chiropractors and dentists. *Sold individually.